The target audience here is the casual administrator with some Linux knowledge. I assume you know how to edit config files, what SSH & sudo are, how to change your password on the command line and a vague idea of how to setup user accounts. Having said that, nothing here is terribly complicated and I’d encourage anyone interested in LAMP to give it go. I’ve tried to include all the details but may have missed some things – feel free to leave a comment if you find you get stuck. The guide assumes you’re using a virtual private server, such as those provided by the “cloud computing” services of Amazon and Rackspace (I use inverted commas because cloud computing is currently one of the most misused terms in the computing field), but there’s absolutely no reason why you couldn’t apply most of this to a local physical server. There are in that case more factors to consider such as local network security, and additional configuration steps to setup the network interfaces, DNS servers etc, but that is beyond the scope of this article. 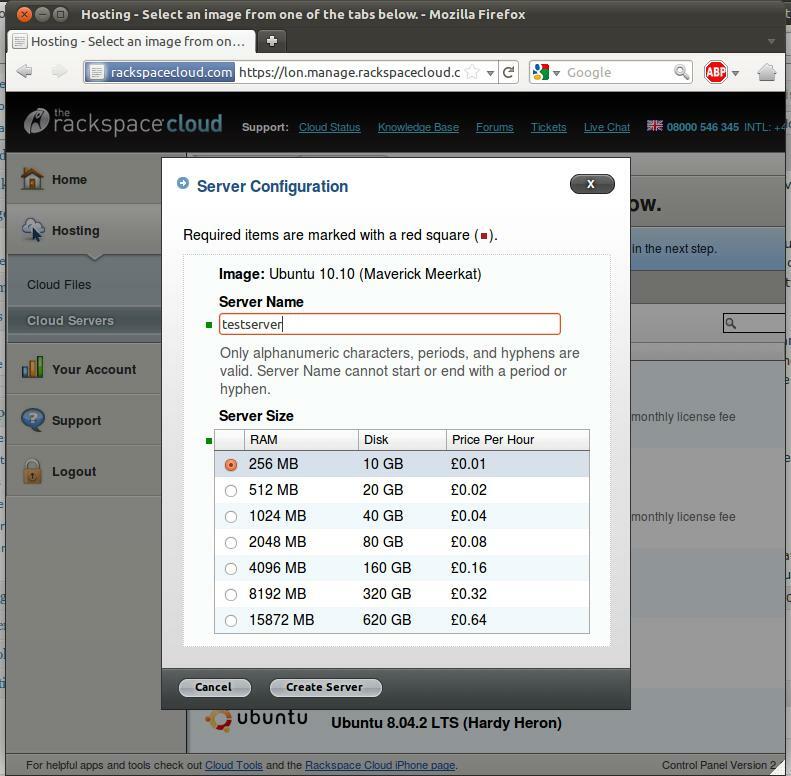 I’m using Ubuntu 10.10 for this guide as it’s the latest image on Rackspace. The changes between server releases tend to be quite subtle and the concepts are fairly generic as far as Ubuntu is concerned so you should be able to apply this to 11.04 and later versions. One final note – while using root is a very bad habit for day to day sysadmin work, when setting up a server most commands needs root privileges so I do tend to run a root shell. Thus sudo commands are omitted, and you should assume root unless stated otherwise (you can gain a root shell from an account that has the appropriate access rights with sudo -i). By the end of the article you should have a functioning LAMP server which is secure by any reasonable measure. In a future article I will cover the installation of WordPress using this as a base. It is a very good idea to have a valid DNS record for your server, one that you don’t use for anything else. Often this is overlooked by novice admins, and can cause problems for software such as mail servers which assume the system’s host name is a valid record. As an example, say you want to create a server to host a website called www.yourdomain.com. Many would simply setup the server’s host name as www.yourdomain.com and be done with it, or worse still “yourdomain”, which is not a valid record. However this can cause headaches if at some point you want to move the web site to a different server, as you’d have to change the original server’s name to something else. It also creates “ambiguous” and messy configurations if you add additional web sites to the host. Why is blog.apples.com hosted on www.oranges.com? Thus I strongly recommend creating a new subdomain that is used to refer to your server and only your server, for example server1.yourdomain.com, and not any web site or service. Any additional records such as “blog.yourdomain.com” or “www.yourdomain.com” can be CNAME records to server1.yourdomain.com in DNS (basically an alias). Pedantic tech note: CNAME records actually cause an extra DNS round-trip the first time the client visits your site because it has to lookup first the A record and then the CNAME record. The penalty is tiny unless DNS is being painfully slow, but if performance is critical all DNS records should be A records pointing directly to the IP address. I’m assuming you already have the OS installed – all hosts do this for you. After commissioning a new image on Rackspace Cloud you should receive the root password via email. By default Ubuntu server has you setup an administrator account at the time of install and does not set a root password, which prevents the root account from being used for console and ssh access. This is a very good thing as the majority of script kiddies will usually try to hit the “root” account. On cloud environments we don’t get that option, so the first thing you need to do is reset the root password and create an administrator account for yourself to use. Hopefully you are never going to use this password again so you may as well make it long and secure. Rackspace provide the facility to reset the root password if you ever need it, and if you really want you can store it in a password database such as the free (and open source) KeePassX. -m is for make home directory. This also copies the contents of /etc/skel so if you want to make a template for your users alter the files there. -G sudo,adm is the supplementary groups to add the account to. By default the primary group is the same as the username which is fine for most purposes. sudo should be obvious, it allows the use of the sudo command as defined in /etc/sudoers. adm is the administrators group, and by default many log files in /var/log are readable by this group. I find it is useful to assign additional permissions to this group where I want to avoid using sudo for a trivial task. -s /bin/bash simply sets the shell to bash. The default is /bin/sh which is not as powerful as bash and lacks many of its features. Logout (exit or Ctrl+D) and reconnect using your new credentials. If you’re unfortunate enough to be on Windows, Putty also supports SSH keys, but I don’t use it so don’t ask me how! Once you’ve logged into your server again set your hostname if you didn’t enter it when the machine was setup. This is simply accomplished by editing /etc/hostname, and rebooting. In this section we will disable root logins and restrict access to only our admin user. Disabling root instantly defeats 90% of dictionary attacks, and restricting access to your own user means that accounts created for other purposes don’t unintentionally get ssh access (many hackers attempt to guess passwords for “apache”, “mysql” etc). The sshd configuration file is /etc/ssh/sshd_config, so open this in your favourite editor, e.g. vim /etc/ssh/sshd_config (if you don’t know how to use vim nano is easier, but you may have to install it first). Note there is also an ssh_config, but that is for the ssh client and does not relate to the server daemon. First change the line that says PermitRootLogin yes to PermitRootLogin no. Note that this makes the Rackspace root password reset ineffective as far as SSH goes, although you can still login via their Java console. The lists are space delimited so if you need to allow more users or groups just add a space between them. The -a here stands for append, were we to omit this option it would overwrite his list of supplementary groups, and charlie would be a member of users but no longer in the sudo or adm groups. NTP stands for network time protocol, and ntpd is the daemon keeps the time in sync. This is important on any server! By default it uses an ubuntu.com time server which is fine by me, so to set this up do apt-get install ntp, enable it with update-rc.d ntp enable and you’re done. If you prefer you can find more time servers at pool.ntp.org. Ufw, or “uncomplicated firewall”, makes this part easy. In the past you’d have to wrestle with complicated iptables rules, but ufw generates these rules for you and makes managing a command line firewall as easy as it could possibly be. Be sure you have enabled port 22 before enabling the firewall or you may find you won’t be able to ssh (when doing “ufw enable” from an ssh session it gives you a warning to this affect). To delete a rule, do exactly the same but with delete in front, i.e. ufw delete allow 22/tcp. If you want to restrict access to certain IP addresses (great if you have a static IP and don’t require access away from home), you can do ufw allow proto tcp from <IP address> to any port 22. If you do this, remember to delete the allow 22/tcp rule! Show current rules with ufw status. Security of Apache (and MySQL) is a HUGE topic, so the key here is keeping things simple. Ubuntu makes sensible choices by default and releases security fixes quickly so by using the distribution packages you’re quite secure out of the box. Thus what’s important is what you do afterwards. You need to create the directories that are going to serve your site. I like to put server content in /srv as that’s what this folder is intended for (see this for a more authoritative stance on the topic). You certainly don’t have to, many people use /var/www. /home/sites is also quite common, and the most incorrect of all. So I’m going to recommend /srv. A good format to use is /srv/servicename/sitename, e.g. /srv/www/example.com or /srv/ftp/example.com. Next we need to setup the Apache config. By default the Ubuntu package sets up a default site which simply says “it works”. You can use the default site and place content in /var/www, but it is much cleaner (and proper) to create your own config. But there’s no harm in using the default site as a starting point. After making sure the default site is working, remove it with a2dissite default. The files in sites-enabled are simply links to files in sites-available, so we’re not losing the default config by doing this. AllowOverride is set to none because .htaccess files are a security risk. If an attacker is able to drop a .htaccess file in your web server through a security oversight in a PHP script or other exploit, they can overwrite the options and potentially access other parts of the file system (e.g. allow symlinks via htaccess, create a symlink to other files on your system and download those). This is one of the reasons why you NEVER run apache as root. Some software (such as WordPress), does make use of .htaccess files for rewrite rules and the like, however there is nothing to stop you from moving these rules from the .htaccess file to the virtual host configuration, and that is what I suggest you do. I’ve removed the cgi-bin entries because most Apache installations will use a module rather than cgi binaries. PHP has mod_php, python has mod_wsgi. Using modules is I think the simplest way to get started, but high-performance sites these days will frequently use proxied daemons such as php-fpm or uWSGI. After altering an apache configuration it’s always a good idea to do a configtest with apachectl configtest. This ensures that you’re not restarting your web server with a bad apache config. While setting up a site I like to have a password set so I can see the results of my work but others can not. Note that Apache’s basic authentication is NOT a secure method for daily use because unless you’re speaking to the server in https the password will be transmitted over the wire in plain text. It really is “basic” authentication. One way of accomplishing this is to use a .htaccess file (assuming AllowOverride AuthConfig is set in the vhost config), but when you have control over the vhost configuration it makes much more sense to put it there. Basically, don’t use htaccess files when you don’t have to as they are both slower and less secure. First of all we need to setup a htpasswd file. 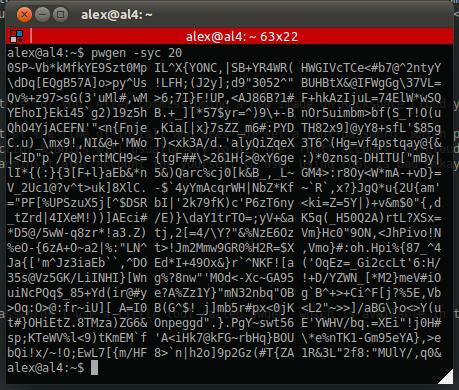 This file contains a username and a password hash to compare against. Create the file with htpasswd file with a new user by typing htpasswd -c /srv/www/htpasswd charlie. Enter a password when prompted, but DON’T use the same password as your shell account. Any machine between you and your server could potentially sniff the password and the last thing you want to be broadcasting is your ssh password! 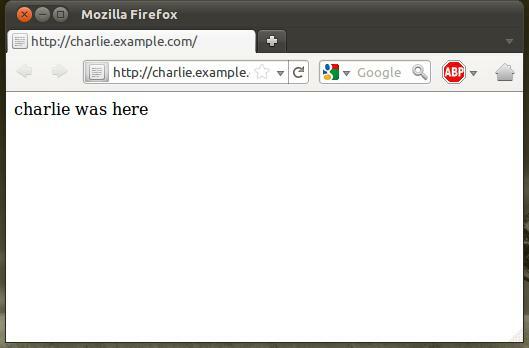 Next we need to setup the AuthConfig of the vhost, so vim /srv/apache2/sites-available/charlie.example.com. Paste the following in the <Directory /srv/www/charlie.example.com> tag, below the line that says “allow from all”. Make sure it is above the </Directory> line. Restart apache and hit your site again (you may need to refresh). Enable it to start on boot by typing rcupdate-rc.d apache2 enable. The basic Apache configuration is now done, but of course we haven’t got anything useful on it yet. In a future article I will cover the installation of WordPress, which is quick and easy – especially if you use the subversion method. This is the very basic initial setup, I’m not going to cover creating databases and assigning permissions – the application defines what these should be. What I will cover is the basic installation of MySQL on Ubuntu, and the running of the mysql_secure_installaton script which should give you into a secure platform from which to build on. 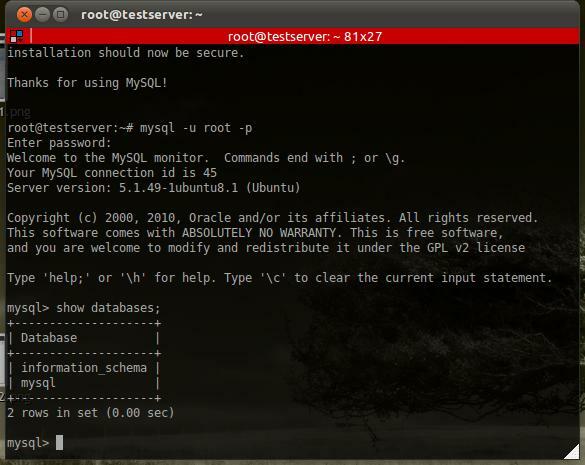 Firstly, apt-get install mysql-server. The Ubuntu package prompts you to set a root password, so set it and store it in your password database. This password should be different to any of your system accounts, because it and other mysql passwords could potentially be exposed by an SQL injection attack (as happened in the recent Sony debacle). However it is also a password you will probably need to use now and again so bear that in mind as well. The mysql secure installation script is installed as part of the Ubuntu/Debian package and is installed in /usr/bin, so run it with /usr/bin/mysql_secure_installation. Basically answer yes to everything except changing root password (because you’ve already set it). Once the script has completed, login to your database with mysql -u root -p.
As a test, run show databases;. Only information_schema and mysql should be present – these two databases are essential for mysql to function, and you should never have to touch them. As the mysql service has been converted to an upstart job, it is already enabled at boot by default. Upstart is still a bit new to me, but the script which controls the service is /etc/init/mysql.conf. To start, stop and restart the service use service mysql [start/stop/restart]. It’s worth noting that you can login to mysql with mysq -u username -pPassword (no space between -p and your password). However you shouldn’t do this because by doing so your password is recorded in you bash_history file (/home/username/.bash_history). Were this file to be exposed somehow, your password would be there to see in plain text. As a way around this on Ubuntu you can add a space in front of the command to omit the command from the history, however this feature of bash isn’t enabled by default on many distributions, and generally it is not good practice to specify passwords on the command line anyway. Back in the day it was recommended to disable mysql network access so that only local services could access mysql. Personally I don’t consider this necessary when we have a firewall in place. If other applications (e.g. another web server) need to access your mysql server over the network, open the port to specific IP addresses and not the general internet. PHPMyAdmin is notorious for security flaws and is frequently probed for on web servers. If you must install PHPMyAdmin, install it in its own vhost to a non-standard location and restrict access by IP address and/or htpasswd (with https). And keep it up to date! A much better approach to PHPMyAdmin is to use a local management tool (such as MySQL Administrator) combined with a ssh tunnel. A quick guide I found on the subject is at here – this covers setting up an SSH tunnel with the free Putty SSH client and logging in with MySQL Administrator. And here’s another one with a bit more detail. This automatically symlinks the module config in /etc/apache/mods-enabled and sets up the config files in /etc/php5. Note that php5/apache2/php.ini is the config for the apache module and php5/cli/php.ini is the config for the binary when called from the command line. If you see only “testing!” then it’s a success, if you see the text as you entered it then there is something wrong with your configuration. A mail server isn’t essential, but it is nice to have one setup so you can receive backup logs and output from cron jobs. By having postfix and mailutils available, scripts and services running on the machine can notify when things go wrong. Before installing postfix however, you’ll save yourself some pain if you server is setup with a valid DNS records as its hostname – so make sure you’ve followed that section above. Start the install with apt-get install postfix mailutils. The ubuntu/debian postfix package prompts you for a configuration template – in this case we want to select internet site. The system mailname should be the FQDN (fully qualified domain name) of your host – e.g. server1.yourdomain.com. This is important, as it affects the headers of any messages sent by the server. But basically after that you are done. Send a test message to yourself with the command echo "test message" | mail -s "testing" your@yourdomain.com and check your email! Fail2ban is in a nutshell a daemon that scans your logs for suspicious activity and blocks IP addresses acting suspiciously at the firewall level. You should be aware that organizations such as universities frequently NAT a lot of people behind one IP address, so you could end up unintentionally blocking legitimate users with this approach. But since fail2ban only blocks addresses from the service they were attacking the odds of it impacting legitimate users are rather low unless you enable the apache module. The main reason to use fail2ban is that it makes dictionary attacks against your server ineffective, as the attacker gets blocked after a predefined number of failed attempts. Installing it is very straightforward, and the configuration is a little more fiddly than it needs to be but simply installing it will protect your ssh server without any additional configuration. To install: apt-get install fail2ban. To configure it you first need to cp /etc/fail2ban/jail.conf /etc/fail2ban/jail.local. Then open /etc/fail2ban/jail.local in your favourite editor. The only change you need to make is destemail = root@localhost, change this to the email address you want to recieve notifications at. Make sure you’ve setup an MTA (mail transport agent) such as postfix (as configured above). You may not want to receive emails every time an IP address gets blocked but I recommend you do for a while, if only to get a feel for how often your server gets probed. By default only the ssh jail is enabled. If you have password protected apache sites you may want to enable the apache jail as well. Make sure it is pointing at the logs for your vhost. Once you’re done restart fail2ban with /etc/init.d/fail2ban restart, and you should receive an email with the subject “[Fail2Ban] ssh: started”. mysql – check the init script, /etc/init/mysql. Try stating it manually with service mysql start, and if it fails examine /var/log/mysql/error.log for any error messages. Always install security updates. While serious exploits are rare for the software installed here, they do come up now and again so you should always keep up with patching. Subscribe to the ubuntu-security-announce mailing list and that way you’ll be notified of any security alerts. The biggest security hole is probably going to be whatever PHP application you run on Apache, therefore a secure apache configuration is essential. Disabling .htaccess helps with this, but make sure the www-data user can’t do too much on your system – it should only have rights to directories serving web sites. If running WordPress make sure you keep up to date. I use Rackspace Cloud Servers (London) for this site, and have so far been happy with the service. It seems to have been born out of Slicehost, as Rackspace acquired them a while back and the features are nearly identical. The console they use for access to your VMs is unfortunately the same – awful. Emergency use only! The DNS hosting feature is nice but a bit limiting as you can’t create TEXT records (I wanted to add SPF records but I guess I’ll either have to self-host or find a third party DNS provider). On the whole the interface is not as well developed as Amazon EC2, but it seems to be a solid alternative and is well worth considering for your hosting needs. This is an excellent tutorial! Thank you so much!!! I’m a newbie at LAMP and am currently using Rackspace Cloud servers. Quick question, what’s the best way to stay on top of security updates? Does the command ‘apt-get update && apt-get –yes upgrade’ update all of the LAMP modules (mysql, apache etc.)? Thanks again for this wonderful resource! Hi Gary, thanks for the comment. thank you so much for compiling this guide, I used your variation blending with a LEMP stack post to setup our new box. I really appreciate it. No problem and thanks for the comment, it’s always nice to hear when your work is useful to someone! heya again alex, I hope you are doing well. I wanted to thank you again and toss up my post http://noconformity.co/2011/11/09/rackspace-cloud-lemp-ubuntu-11-04-server/ on this setup up as well. take a peak, let me know what you think. also do you use twitter? have a great weekend. Can I hire you to create this for me and secure it via my Rackspace cloud account? Sorry but I’d prefer not to. Amazing tutorial!, It’s people like you that make the internet. You put a lot of effort in so fair play, very useful, very knowledgable… the list goes on, so cheers from Ireland! Cheers Ros for the kind words! 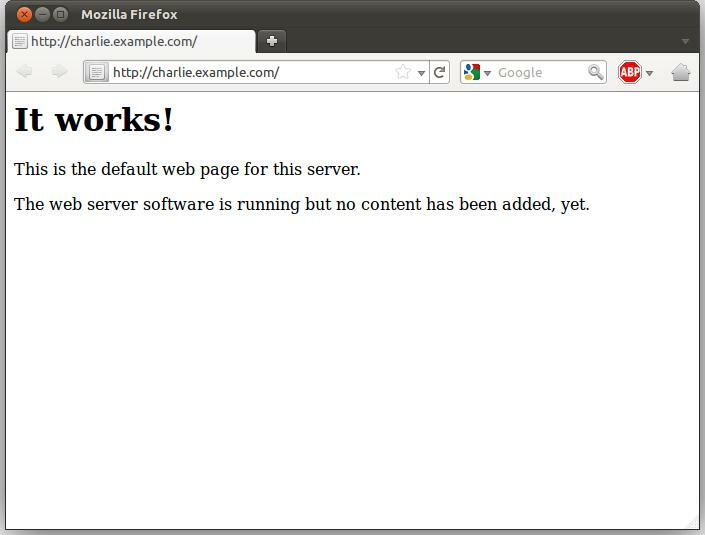 Worth noting that once you’ve got more than one vhost setup, you’ll need to add the ServerAlias directive to each vhost config (in this case /etc/apache2/sites-available/charlie.example.com), or your sites won’t work. Thanks this is dead right, an omission on my part. I’ve added it above. What is the price of Rackspace hosting? I tried to find on their site but not sure. About 200$/year? Depends on the spec and service level you require. But since phasing out the 256mb instance (which performs badly with WordPress anyway), the bare minimum cost for a self-serviced 512mb VM on the Rackspace Cloud would be about $170 per year. What is the best place to host the project? /srv/www/example.com or /home/example/public_html? Why, what are the advantages and disavantages of each method? It really doesn’t matter as long as it allows you to partition and setup your system the way you want. For example you might mount a partition to /srv/www with the option “noexec” which could stop an attacker from executing a malicious file they uploaded (in practice this doesn’t offer much in the way of additional security however, not a great example). Mounting /home noexec would be quite inconvenient. /var/www is fine amd the most commonly accepted location for static html. /opt is commonly used, and some people like to use /usr/local/share (/usr/share should be avoided because it’s for files installed by the package manager on most systems). I dislike storing web content in home because /home is for user directories and example.com is not a user. I believe the practice arose out of shared hosting, where multiple users shared a single web host. In those situations it is common (and correct), to place web content under /home/username/public_html (or similar). However in modern times this scenario is rare, and placing files under /home that are not specific to a particular local user is logically “incorrect”. Don’t worry about it too much though. I followed your guide it is excellent. I ran into one problem though, UFW does not work properly with ubuntu 12.10. After I enable it, I can’t run apt-get. For now I just turn it off run apt-get then turn it on, but I am curious if you have heard of anyone else running into this issue? Many thanks for the comment Danny. Assuming you did ufw allow 80/tcp and ufw allow 443/tcp as per the guide, as a first troubleshooting step I’d try accessing other web sites with wget or links. If they don’t work, dumping the resulting iptables filters with iptables -L might be informative so we can see the rules that ufw is applying. Probably what’s happening though is that outbound DNS is blocked. Try ufw allow out 53 (don’t specify /tcp as we want udp as well). You may need to do ufw allow out 1024-65535/udp as well. Thanks Alex. Still not working. I am going to ask a few people I know. I dumped the iptables, but those settings don’t mean much to me. I need to research how to read them. It for sure is blocking outgoing dns/web traffic. Weird! You know some solution maybe? You did nothing wrong, adding a user requires root permissions. As mentioned at the start, I ran most of the commands while logged in as root (sudo -i). A bad habbit but much more convenient during intial setup. I need some support setting proftpd. I have installed my server just as explained above and it works quiet well. No issues wit anything like fail2ban, tripwire, mysql_secure_installation etc but stuck with proftpd. When I try to login through FTP it says “530 Login Incorrect”. What am I doing wrong? I added user and group in proftpd and did all setup. Can you help? It seems I didn’t added proper “shell” for the user. In your example it is “bash” but for FTP user, what should be the shell? Haven’t done a lot with ProFTPd, but you will need to make sure the pam authentication method is enabled. FTP accounts should not need a shell at all (in fact for security’s sake I’d strongly suggest they do not). Great article! I was reading that its recommended to install apache and php as different users. Any input on that? Is this difficult? Any complications involved connecting the services? Yeah as the article you link implies, you can’t use a different user for php if you’re using mod_php or a cgi script as the apache process is responsible for executing your code. Using php-fpm means you can run your php scripts as a separate user, because a separate process executes your code, and the web server (e.g apache or nginx) connects to it over a unix socket. The php-fpm setup is more complicated, but also more secure, more flexible and more scalable. This blog is running WordPress on php-fpm via nginx, and I’ve been meaning to write a how-to article. Thanks James! This post keeps getting hits so I’m sure it will be. I have successfully created “CHROOT” and jailed the “user” in the designated directory (in my case it is /var/www). Now I want this “user” to be able to login to terminal through SSH and only able to change password. No other commands are required for this user. I have seen many lengthy articles which state about copying the bash shells from root directory to the chrooted directory. I would like to know if there is a specific & more simpler way of achieving what I want? If you want the user to only be able to change their password, I would set their login shell to /usr/bin/passwd – this is much simpler than setting up a chroot. Thanks @Alex for your response! Clarification: The user is allowed to login through SFTP and jailed in the designated directory. Additionally the user should also be able to login through SSH and change his password. These two settings are required simultaneously! In that case… not really. Simplest way would be to copy in bash and passwd, add an alias called rbash to bash, and set shell to rbash. As the numerous articles will no doubt tell you, you can use ldd to determine the libraries that are required. Another solution might be to run a separate ssh daemon on a different port, with configuration which would force the shell to passwd, so you can use sftp unimpaired on the default daemon. Not sure of the specific config you’d need, but the man pages should have all the info. Alternatively you could setup a web daemon which, when sent the correct credentials, would run chage -M in the background. This would mean the user would be prompted to change it on the next login, something that the SFTP protocol supports. That’s getting into dev territory though, and requires authentication and sanitisation of user input for it to be secure. Also, maybe it would simply be easier for this web daemon to update the password itself (although this carries more risk security wise). And it works like a charm. Though it took time to figure out the right way, but once found, it was a cake walk! Great! Glad to hear you got it sorted. Thanks for the awesome article! I also used some other resources while working with your article to setup apache2 in conjunction with tomcat. I’m trying to host a couple of websites that would be deployed on tomcat and trying to use apache as the smart proxy server in between. So if I was trying to setup two websites, I’m assuming I would need to add another config in the sites enabled folder and have that picked up by the apache2.conf that’s basically doing the overall configuration? Hi Varun, thanks for the kind words. You are correct, to setup another site you would add another file to sites-enabled (or to sites-available and link it to sites-enabled). Web browsers send a “Host:” header, which tells apache which website (dns host) the client is looking for, which it uses to determine which vhost to serve by matching ServerName or ServerAlias. As you are proxying a site and not running a php or specific apache module, have you considered nginx? Nginx was built for proxying and does it more efficiently than apache does, and is what I’d personally recommend for this purpose.